In order to ensure that the solder paste is suitable for proving the highest performance for PCB assembly it is necessary to ensure that it maintains the required properties. To achieve this it is imperative that the solder paste is stored correctly. It should always be stored in an airtight container to prevent oxidation. 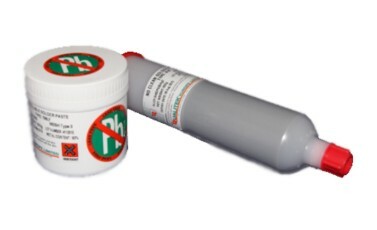 Solder paste is available in various different containers but the most common within the industry is in tubs or cartridges as can be seen above. It is recommended that solder paste is supplied in cartridges as this method provides the least chance for the solder paste to come into contact with the atmosphere and oxidize. In addition to this the solder paste should be stored at a temperature between 0-10 °C (32-50 °F) to provide the longest possible shelf life (Generally 6 months depending on solder paste selected. Please note the shelf life is determined from the date of manufacturing). The material should be placed in a storage area designed to maintain this temperature range (refrigerator or cold room) immediately upon receipt. Cartridges are best stored vertically (tip down) and should always be used on a first in first out (FIFO) basis. Solder paste should be allowed to reach room temperature (19-25°C (66-77°F)) without forced heating before use for a recommend time of between 6-8 hours, depending on packaging size. Once in use the solder paste should be used within 2 weeks - Exceeding 2 weeks of room temperature storage will compromise the performance of the solder paste during printing. Within the solder paste printing machine the best practice is to maintain the environment inside the printer between 22°C – 29°C and 40% - 60% RH (refer to technical data of solder paste selected). It may be required for the printing machine to be fitted with a temperature and humidity control unit depending on the ambient temperature and humidity within the place of use. Solder paste should ideally be dispensed using an applicator gun to produce a even bead on the stencil of approximately 12mm (1/2") in diameter and should cover the length of the PCB. The solder paste should be replenished if the bead is <12 mm (1/2”) and replaced when the stencil life has been exceeded or has been exposed to high temperatures inside the printer >29°C (84°F). Generally solder paste has a stencil life of up to 24 hours but this can vary between different manufacturers - refer to datasheet. In most cases the stencil life isn't a problem as fresh solder paste is regularly being added and kneaded with the movement of the squeegees. See Solder Paste Printing Process for more details.